The Chihuahua’s history is puzzling and there are many theories surrounding the origin of the breed. Both folklore and archeological finds show that the breed originated in Mexico. The most common theory and most likely is that Chihuahuas are descended from the Techichi, a companion dog favored by the Toltec civilization in Mexico; however, no records of the Techichi are available prior to the 9th century. It is probable that earlier ancestors were present prior to the Mayans as dogs approximating the Chihuahua are found in materials from the Pyramids of Cholula, predating 1530 and in the ruins of Chichen Itza on the Yucatán Peninsula. Some historians believe that the Chihuahua came from the island of Malta in the Mediterranean. More evidence for this theory lies in European paintings of small dogs that resemble the Chihuahua. One of the most famous paintings is a fresco in the Sistine Chapel by Sandro Botticelli dated 1480–1482. The fresco, depicting the Trials of Moses, shows a boy holding a tiny dog with round head, large eyes, big ears, and other characteristics similar to those of the Chihuahua. The painting was finished ten years before Columbus returned from the New World. It would have been impossible for Botticelli to have seen a Mexican dog, yet he depicted an animal strikingly similar to a Chihuahua. A progenitor of the breed was reputedly found in 1850 in old ruins near Casas Grandes in the Mexican state of Chihuahua from which the breed gets its name, although most artifacts relating to its existence are found around Mexico City. The state borders Texas, Arizona and New Mexico in the United States, where Chihuahuas first rose to prominence. Since that time, the Chihuahua has remained consistently popular as a breed, particularly in America when the breed was first recognized by the American Kennel Club in 1904. In terms of size, the present day Chihuahua is much smaller than its ancestors, a change thought to be due to the introduction of miniaturized Chinese dogs, such as the Chinese crested dog, into South America by the Spanish. Breed standards for this dog do not generally specify a height, only a weight and a description of their overall proportions. As a result, height varies more than within many other breeds. Generally, the height ranges between six and ten inches; however, some dogs grow as tall as 12 to 15 inches (30 to 38 cm). Both British and American breed standards state that a Chihuahua must not weigh more than six pounds for conformation. However, the British standard also states that a weight of two to four pounds is preferred and that if two dogs are equally good in type, the more diminutive one is preferred. The Fédération Cynologique Internationale (FCI) standard calls for dogs ideally between 1.5 and 3.0 kg (3.3 to 6.6 lbs. ), although smaller ones are acceptable in the show ring. Pet-quality Chihuahuas (that is, those bred or purchased as companions rather than show dogs) often range above these weights, even above ten pounds if they have large bone structures or are allowed to become overweight. This does not mean that they are not purebred Chihuahuas; they do not meet the requirements to enter a conformation show. Oversized Chihuahuas are seen in some of the best, and worst, bloodlines. Typically the breed standard for both the long and short coat chihuahua will be identical except for the description of the coat. 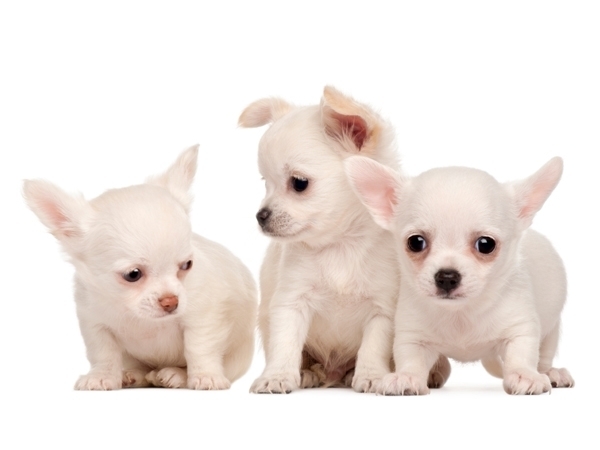 Chihuahua breeders often use terms like Teacup, Pocket Size, Tiny Toy, Miniature or Standard to describe puppies. These terms are not recognized by the breed standards and are considered marketing gimmicks to inflate the value of puppies. Chihuahuas are commonly referred to as either Apple heads or Deer heads, the former having short noses and rounded heads similar to that of an apple; the latter having longer noses and more elongated heads. The Kennel Club in the United Kingdom and the American Kennel Club in the United States only recognize two varieties of Chihuahua: the long-coat, and the smooth-coat, also referred to as short-haired. They are genetically the same breed. The term smooth-coat does not mean that the hair is necessarily smooth, as the hair can range from having a velvet touch to a whiskery feeling. Long-haired Chihuahuas are actually smoother to the touch, having soft, fine guard hairs and a downy undercoat, which gives them their fluffy appearance. Unlike many long-haired breeds, long-haired Chihuahuas require no trimming and minimal grooming. Contrary to popular belief, the long-haired breed also typically sheds less than their short-haired counterparts. It may take up to two or more years before a full long-haired coat develops. Chihuahuas come in virtually any color combination, from solid to marked or splashed, allowing for colors from solid black to solid white, spotted, sabled, or a variety of other colors and patterns. Colors and patterns can combine and affect each other, resulting in a very high degree of variation. Common colors are fawn, red, cream, chocolate, blue, and black. No color or pattern is considered more valuable than another. The merle coat pattern, which appears mottled, is not traditionally considered part of the breed standard. In May 2007, The Kennel Club decided not to register puppies with this coloration due to the health risks associated with the responsible gene, and in December of that year formally amended the Breed Standard to disqualify merle dogs. The Fédération Cynologique Internationale, which represents the major kennel club of 84 countries, also disqualified merle. Other countries' kennel clubs, including Canada, Australia, New Zealand, and Germany, have also disqualified merle. However, in May 2008, the Chihuahua Club of America voted that merles would not be disqualified in the United States, and would be fully registrable and able to compete in American Kennel Club (AKC) events. Opponents of merle recognition suspect the coloration came about by modern cross-breeding with other dogs, and not via natural genetic drift. A Chihuahua showing signs of aggression. A Chihuahua must be chosen with care, as the temperament of its owner can make a difference in the temperament of the pup. Ill tempered Chihuahuas can be easily provoked to attack, and are therefore generally unsuitable for homes with small children. The breed tends to be fiercely loyal to one particular owner and in some cases may become over protective of the person, especially around other people or animals. They do not always get along with other breeds, and tend to have a "clannish" nature, often preferring the companionship of other Chihuahuas over other dogs. These traits generally make them unsuitable for households with children that are not patient and calm. Chihuahuas love their dens and will often burrow themselves in pillows, clothes hampers, and blankets. They are often found under the covers or at the bottom of the bed, deep in the dark and safety of what they believe is their den.